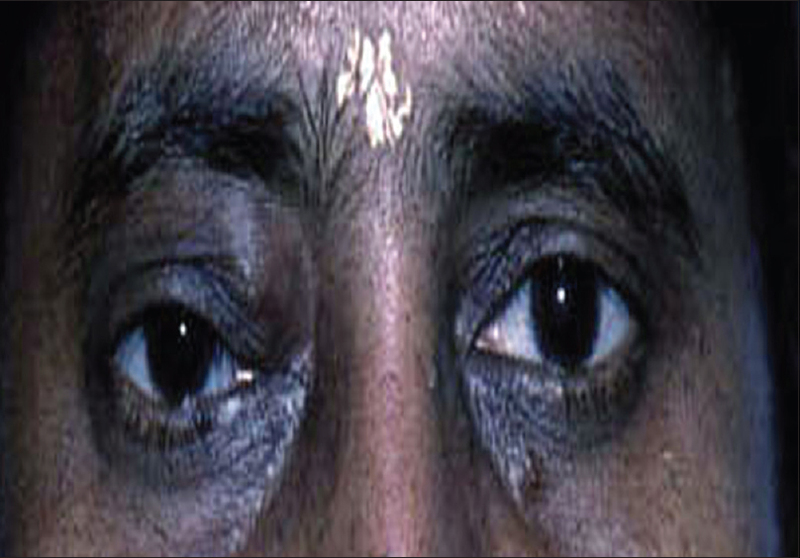 Lymphoma of the orbit are painless, soft, palpable masses occurring around the eyeball , that occur commonly in elderly individuals and responds well to chemotherapy and radiotherapy. Prognosis depends on the histological type, grade and stage and treatment modality employed. In this case series, all the treated patients responded well with radiotherapy as well as chemotherapy. Lymphoma, a slow-growing, low-grade malignant tumor of the orbit occurs commonly in elderly individuals and responds very well to chemotherapy and radiotherapy. Although the orbital cavity is devoid of lymphatics, isolated lymphoma orbit is of common occurrence. They are painless, soft, palpable masses occurring around the eyeball. 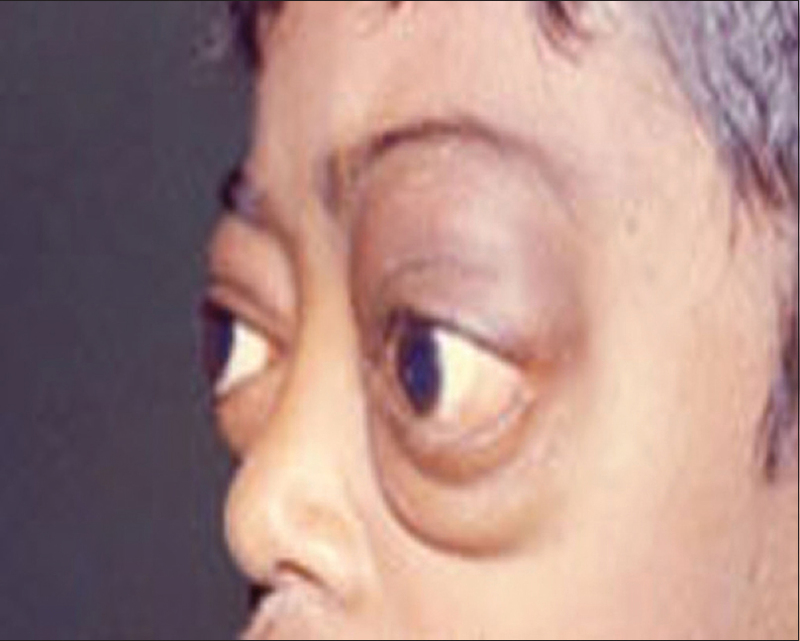 Orbital lymphoma may be unilateral or bilateral, constituting more than half of all orbital malignancies. 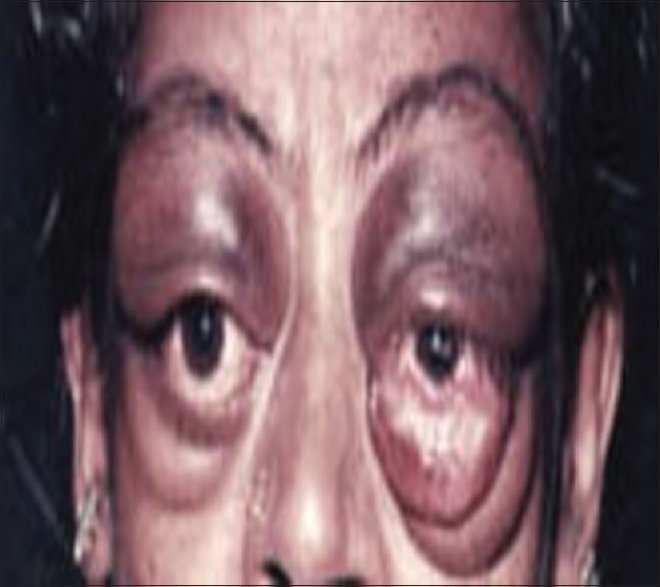 It is a type of non-Hodgkin lymphoma (NHL) that originates in the conjunctiva, lacrimal gland, soft tissues of the eyelid, or extraocular muscles; it is most commonly extraconal in location. The clinical presentation is nonspecific associated with diffuse swelling in orbit. Usually, neither the vision nor the extraocular movements are affected. The eyeball can be displaced depending on the site and duration of the mass within the orbit. We are reporting various presentations recorded by us. 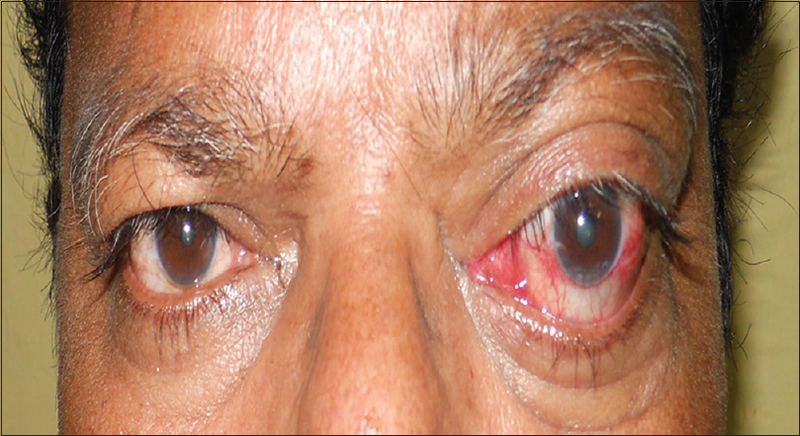 A 65-year-old male patient reported with painless proptosis of the left eye of 3-year duration after consultations in different centers. The eyeball was pushed forward laterally [Figure 1]; the other eye was normal with good vision. On palpation, a soft mass was palpable in the upper half of orbit. Extraocular movements were normal. There was no swelling in other parts of the body and no significant lymphadenopathy. B-scan and Computed tomography scans confirmed the presence of mass within the orbital cavity in extraconal space; any bony erosion was ruled out. 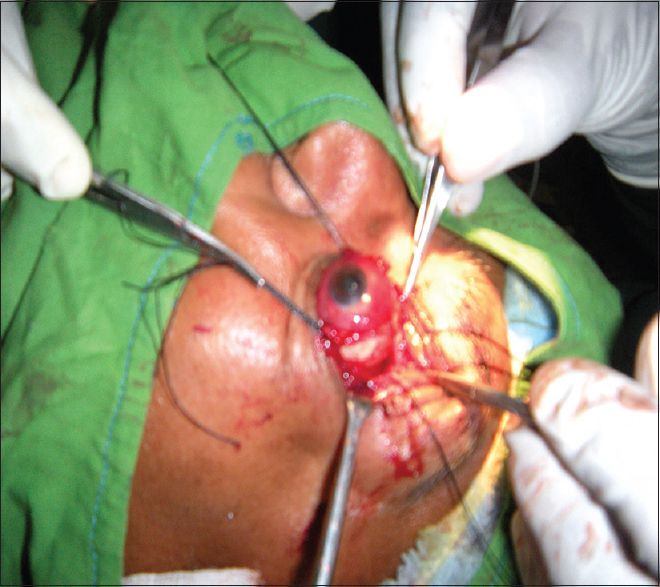 Partial excision of the mass was performed by transconjunctival route carefully avoiding damage to extraocular muscles and other periocular structures [Figure 2] and [Figure 3]. Biopsy of the mass proved to be a case of lymphocytic lymphoma with mature lymphocytes. He was started on radiotherapy; the mass responded well by complete regression [Figure 4]. He was followed up for more than 1 year without any recurrence. 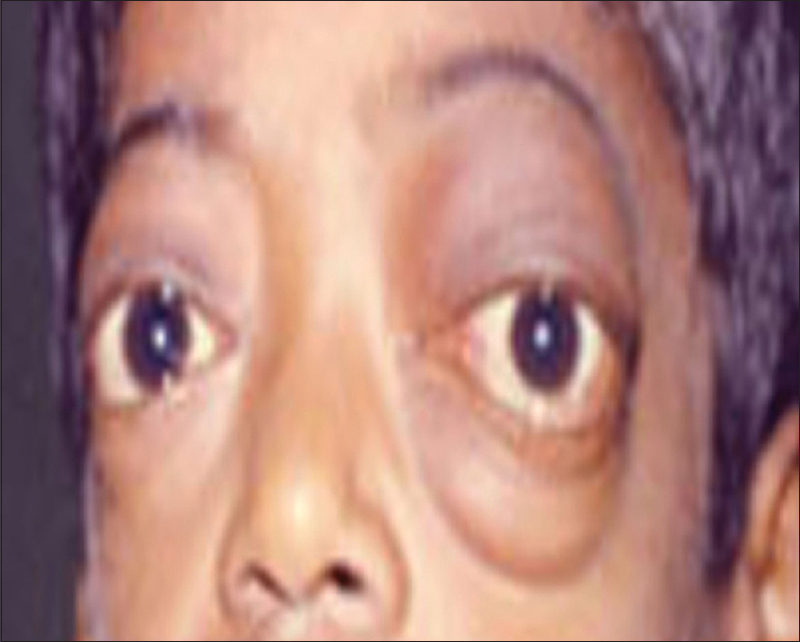 An elderly woman came with proptosis of the left eye [Figure 5]. 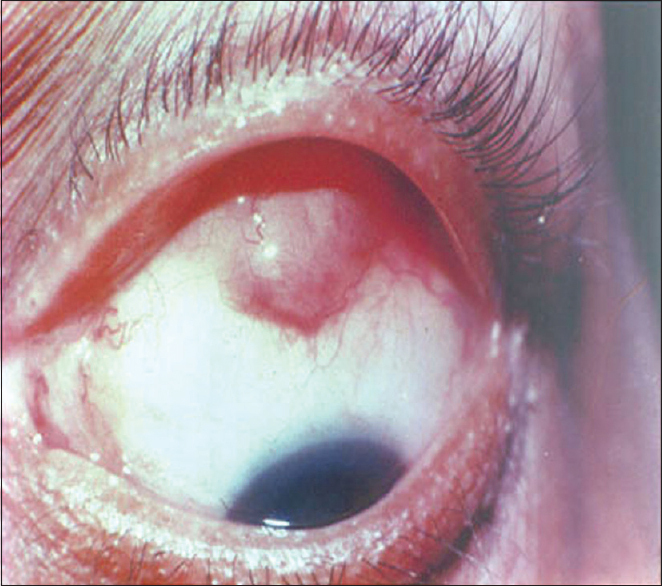 While looking downward, she had a subconjunctival mass with posterior extension [Figure 6]. The mass was soft in consistency. Vision and extraocular movements were normal. 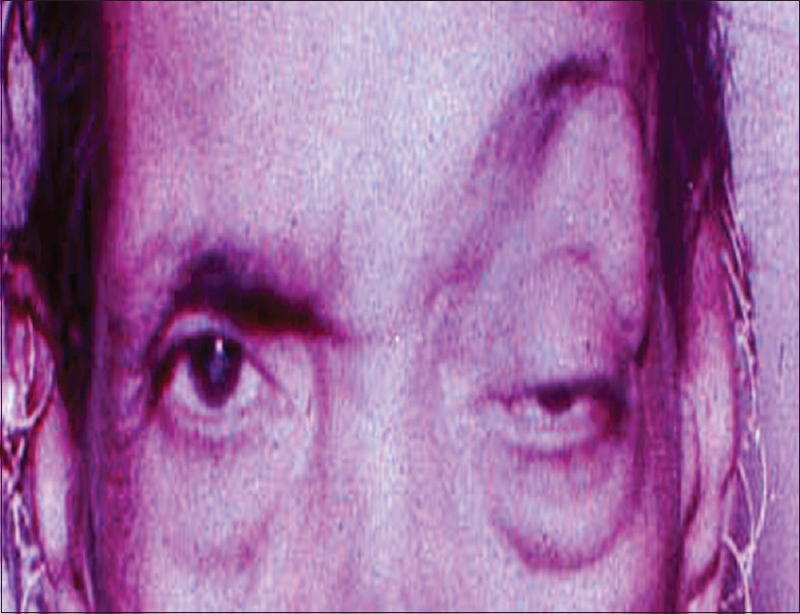 Clinically diagnosed as lymphoma, and after basic investigations, the mass was excised through skin incision along the upper orbital margin [Figure 7]. Confirmation of the mass as lymphoma was done by pathologist and radiotherapy was given with good response. A 50-year-old female reported with a soft mass slowly increasing size in the upper inner quadrant of the right orbit [Figure 8]. The extraocular moments and vision were normal. Incision biopsy after basic investigations confirmed it to be lymphoma. She underwent radiotherapy, and the residual mass also regressed. There was no recurrence during the follow-up period of more than 5 years. 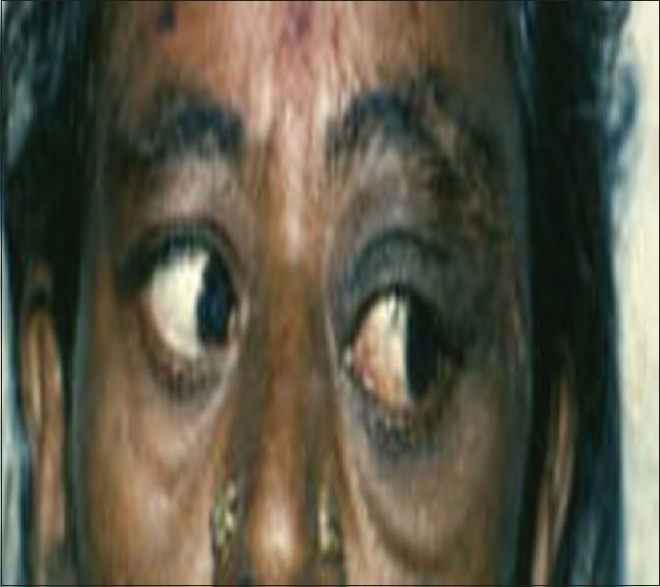 A 45-year-old female reported with bilateral, painless proptosis of 6 months duration more in the left eye [Figure 9]. Transconjunctival incision biopsy confirmed it to be a case of bilateral orbital lymphoma. She was advised radiotherapy, but she was scared, under impression that electricity will be directly passed into her body and could not be convinced about the nontouch, innocuous nature of irradiation. Chemotherapy was instituted with a combination of cyclophosphamide, doxorubicin, vincristine, and prednisolone. The mass in both eyes regressed [Figure 10]. 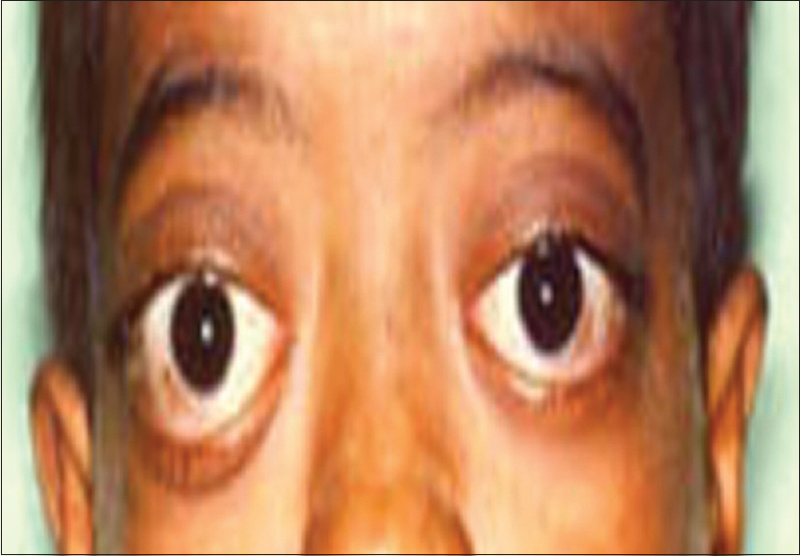 A 15-year-old boy came with bilateral proptosis [Figure 11] and [Figure 12] more in the left eye than right. There was no lymphadenopathy in other parts of the body. Vision and ocular movements were normal. Routine hematological Investigations proved negative. Following biopsy confirmation he underwent radiotherapy, and the proptosis regressed [Figure 13]. Orbital and adnexal lymphomas are associated with systemic lymphoma in 30%–35% of cases. Hence, all patients with ocular lymphoma should have a complete workup to rule out systemic lymphoma. 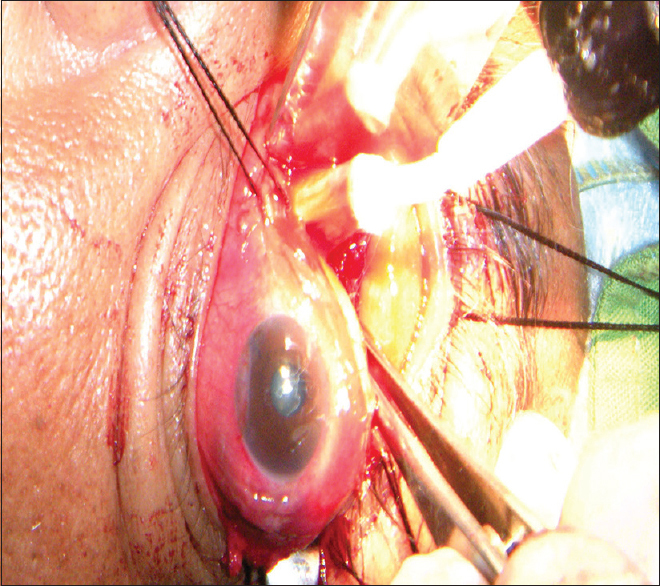 In our cases recorded, all had orbital involvement without any systemic manifestation. 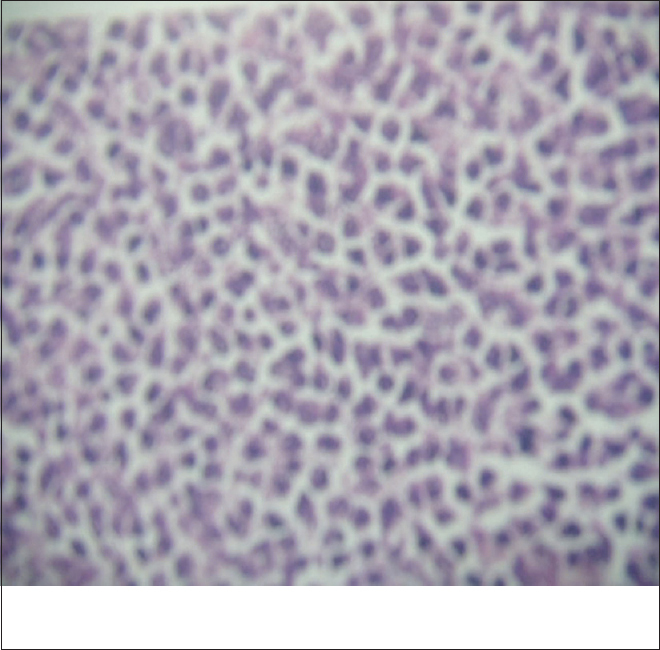 Pathologically, the tumor is composed of uniform sheets of mature lymphocytes [Figure 14]. NHL is further divided into main 2 types based on whether it starts in B lymphocytes (B cells) or T lymphocytes (T cells). There are many different types of B-cell lymphomas. Treatment usually depends both on the type of lymphoma and the stage and extent of the disease. Almost 80%of orbital and adnexal lymphomas are of low-grade variety, with B-cell lymphomas and extranodal marginal zone lymphoma of the mucosa-associated lymphoid tissue type (MALT lymphoma) being the most common histological diagnosis. MALT lymphomas comprise a distinct set of tumors that exhibit the unique property of “homing,” which permits lymphoma cells to adhere to other epithelial and mucosal sites, thus enabling bilateral involvement. Other subtypes have also been reported, including follicular lymphomas, diffuse large B-cell lymphomas, and mantle cell lymphomas. Treatment is by radiotherapy as they respond well. The median prescribed dose was 36 Gy (range 30–40 Gy) and chemotherapy of late with advent of newer drugs such as rituximab added to combination of cyclophosphamide, doxorubicin, vincristine, and prednisone, is considered as the first line of management in some centers and radiotherapy is the preferred treatment of choice in some other centres. The treatment options for orbital lymphoma are chemotherapy, immunotherapy, targeted therapy, radiation therapy, stem cell transplant, and in rare cases, surgery. Prognosis depends on the histological type, grade and stage and treatment modality employed, but the overall 5-year survival rate is approximately 60%. In our cases, all the treated patients responded well with radiotherapy as well as chemotherapy. Dr. G. Thilagavathi M. D., (Pathology) for biopsy confirmation and Prof. Dr. Chellam Balasundaram PhD., (Rtd), Professor of Animal Sciences, Bharathidasan University, Tiruchirappalli for critically going through the manuscript and valuable suggestions. We also thank Mr. B. Athikannan of G. K. S. Computers for his secretarial assistance. Sharma T, Manjunath Kamath M. Eyenet magazine. In: Fekrat S, Scott IU, editors. 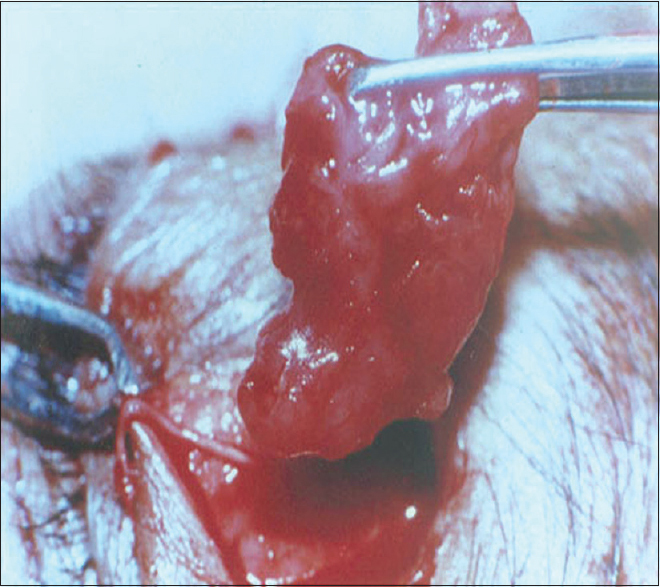 Diagnosis and Management of Orbital Lymphoma. AAO.org: American Academy of Ophthalmology; 2015. Özkan MC, Palamar M, Tombuloǧlu M, Hekimgil M, Özsan N, Saydam G, et al. Ocular adnexal lymphomas: Single-center experience. Clin Lymphoma Myeloma Leuk 2015;15 Suppl: S158-60. Lau HY, Chua ET, Yang TL, Chua EJ. Orbital lymphoma: Results of radiation therapy. Ann Acad Med Singapore 1998;27:474-7. Hiddemann W, Kneba M, Dreyling M, Schmitz N, Lengfelder E, Schmits R, et al. Frontline therapy with rituximab added to the combination of cyclophosphamide, doxorubicin, vincristine, and prednisone (CHOP) significantly improves the outcome for patients with advanced-stage follicular lymphoma compared with therapy with CHOP alone: Results of a prospective randomized study of the German low-grade lymphoma study group. Blood 2005;106:3725-32.